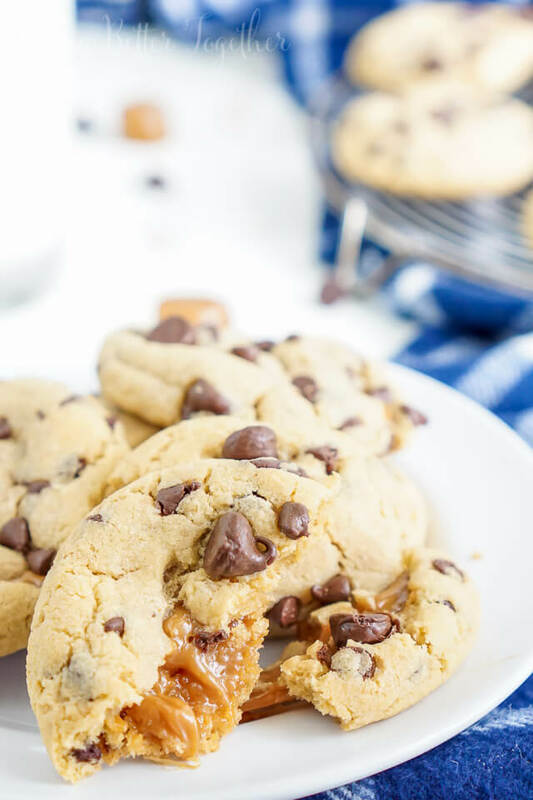 These Peanut Butter Caramel Stuffed Chocolate Chip Cookies are a bit of a mouthful, but a super delicious one! 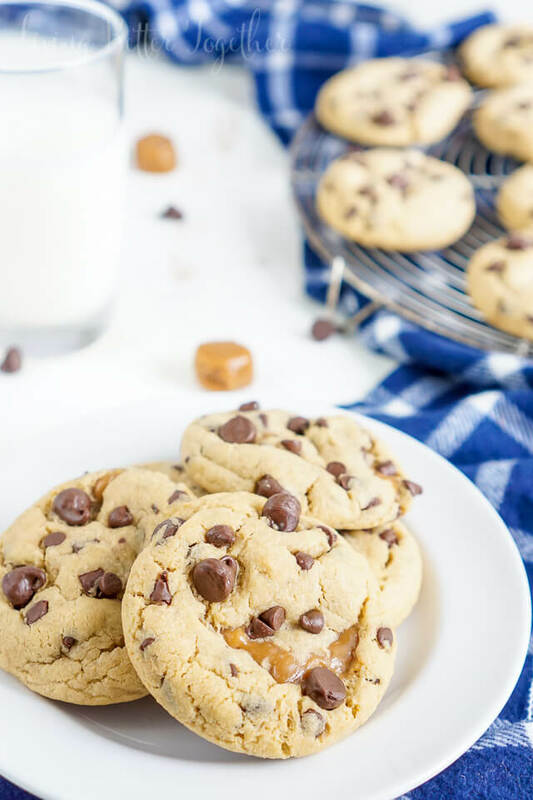 Soft peanut butter pudding cookies stuffed with soft caramels and loaded with chocolate chips! The first batch is ready in less than 30 minutes! Somehow September has arrived and even though it’s my favorite month, I’m not sure I’m quite ready for it this year. This time around, September is bringing a lot of changes with it, including a new name for this lovely website of mine. Meet Sugar & Soul the new face of Living Better Together. Don’t worry everything that’s here now will still be here, it will just be getting a new name and face lift. Expect things to slowly change over in mid September! Now that I’ve introduced you to Sugar & Soul, let’s talk a little bit about that Sugar part shall we? So this month’s Peanut Butter Bash ingredient was Caramel. You might not think is would be all that hard to come up with something delicious using peanut butter and caramel, but I was stumped. Like I almost didn’t make anything this month, that’s how stumped I was. Then Matt said let’s make stuffed cookies. I’ve always dreamed of making those delicious cookies stuffed with gooey goodness, but I never have. Wanna know why? Because I’m dumb. That’s it, plain and simple, I’m an idiot for not making a batch sooner. I mean cookies are good, but when they have a filling in the center, oh man, that’s a whole new level of awesome! And these cookies are AWESOME! For one, there’s nothing quite like a soft peanut butter cookie, especially when you add pudding mix. When you add chocolate chips into the mix it just seems like the natural thing to do. Add caramel and it’s like… *mind blown*. Really, guys… GO MAKE THESE COOKIES! Line cookie sheet with parchment paper and set aside. Cream butters and sugars together until smooth. Fold in chocolate chips, I usually do this with my hands. Scoop out 1½ - 2 tablespoon sized scoops and stuff a caramel into the center of each, working the dough around it to seal. If using long thin caramels, cut in half before inserting into the dough. Place on prepared cookie sheet about two inches apart. I used both Werther's and Lancaster Caramels. Both worked fine but I liked the Lancaster more. 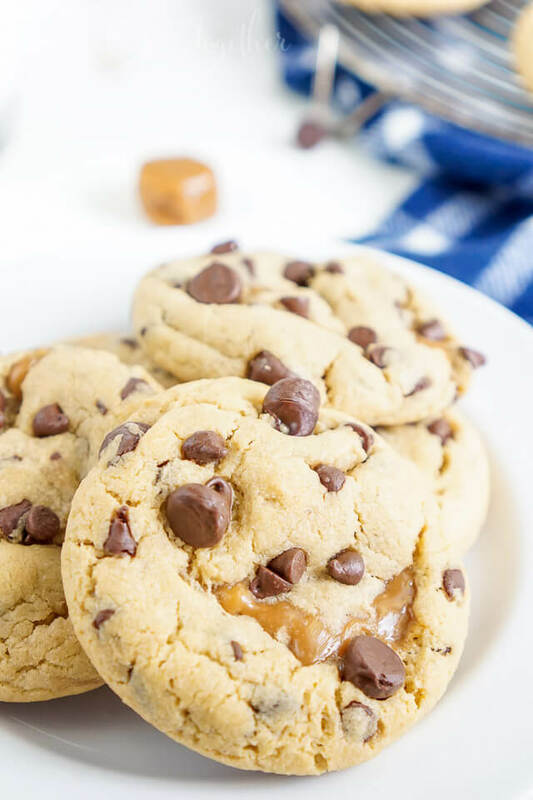 Check out this month’s other Peanut Butter Bash recipes below! My mouth is watering right now!! 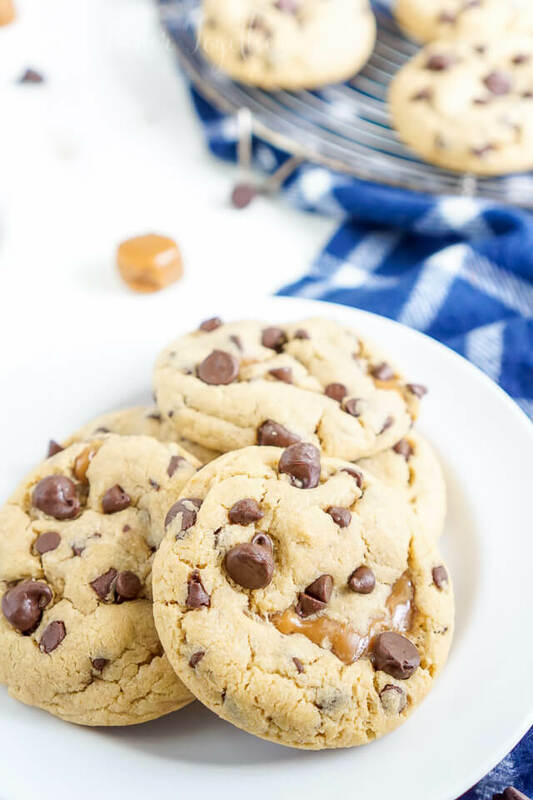 Delicious looking cookies! I love peanut butter. Thanks for sharing in the THursday Favorite Things Blog Hop! You are killing me girl… seriously! These cookies look TOO good and I GOTTA try them out! Pinning!!! 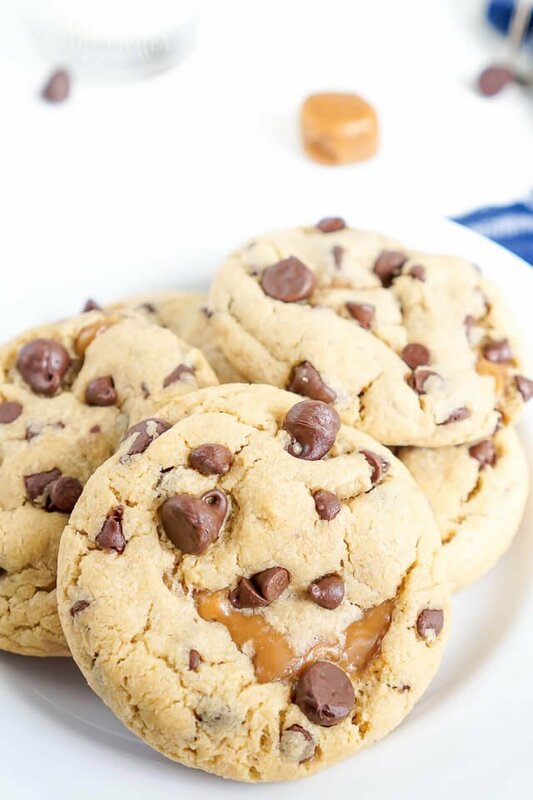 Peanut Butter and caramel… I’m already drooling! What a great idea to stuff the cookies. Definitely going to have to try this, thank you. Caramel + chocolate is simply the best! I will have to try this recipe for sure. Thank you for linking up to Creative K Kids’ Tasty Tuesdays Linky Party. I have pinned your recipe to our Tasty Tuesday’s Pinterest Board. 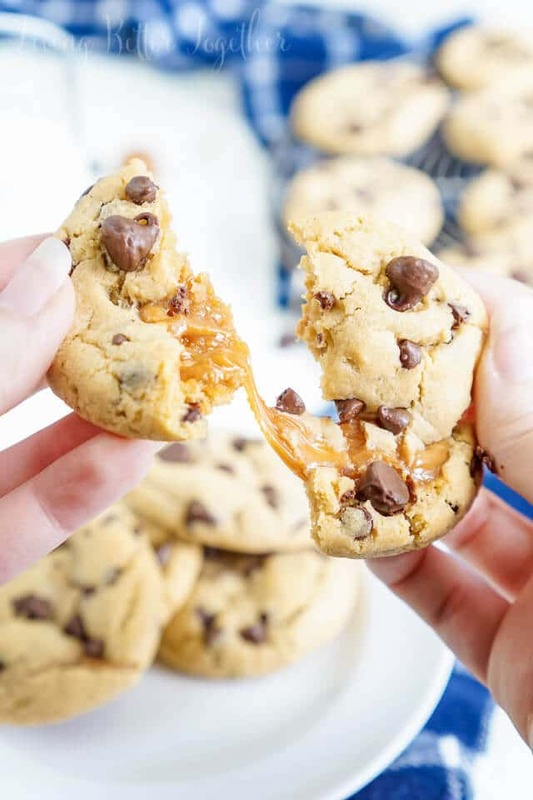 Could I use Kraft Caramels in this recipe?????????? Please advise. Thanks.